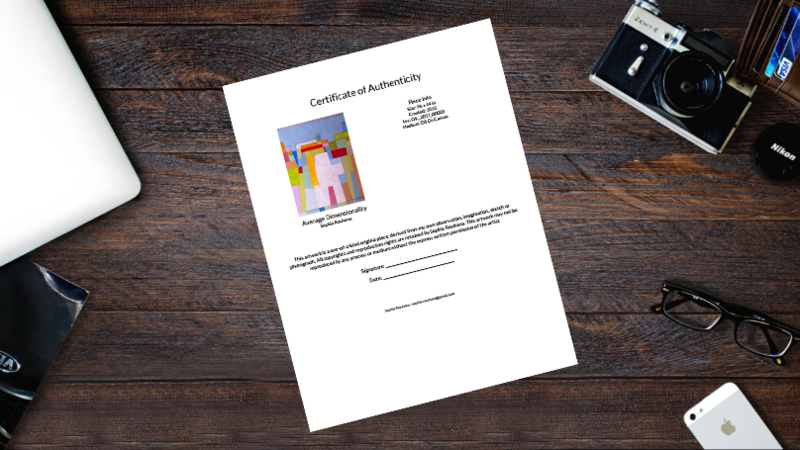 Do You Need a Certificate of Authenticity for Your Art? Lately, we’ve heard a lot of artists asking about whether or not to include a Certificate of Authenticity with their art. Even if you are just starting out or feel doubtful your art will ever become that collectible—the answer is yes! You never know when your art career will take off, and a signed, detailed Certificate of Authenticity helps collectors immensely when it comes to tracing your piece’s history and proving it’s the original. That being said, having this provenance in place can greatly increase the value of your art. So, how do you go about creating one? Take a sigh of relief, because, in three easy steps, you can make a professional Certificate of Authenticity right from Artwork Archive. First, select the piece for which you need to create a Certificate of Authenticity. TIP: If you haven’t already, this is a great time to mark the piece as sold. That way you can keep track of who bought what, when, and for how much, plus get insights to inform your art business strategy. 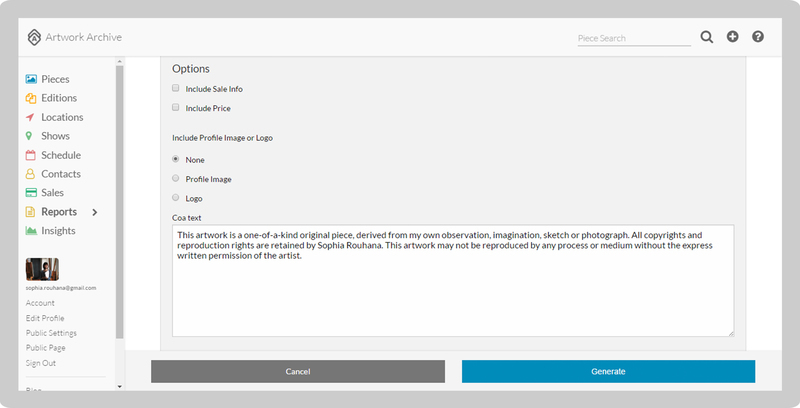 Next, fill in the details you want to include, such as price, an image or logo, and text where you should express copyright protection and more. 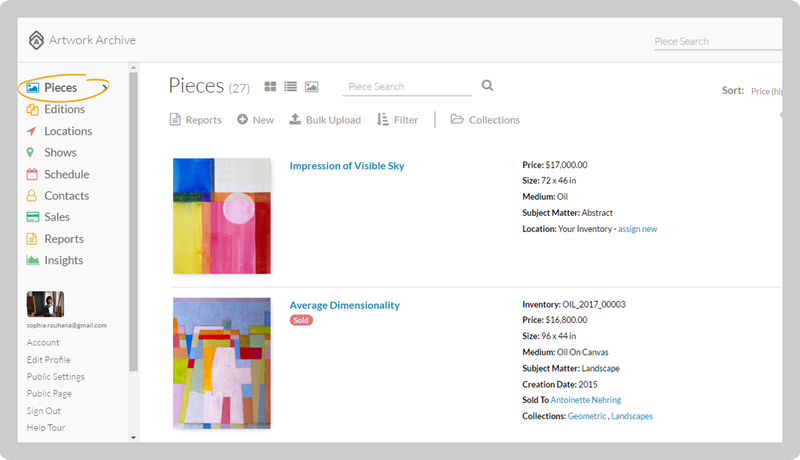 Important details like medium, dimensions, and title will automatically be included from your piece in Artwork Archive. Once you’ve finalized the details, just click Generate. You’ll be redirected to Reports where you can download, print, sign, and date a certificate that’s ready to be shipped out with your art! 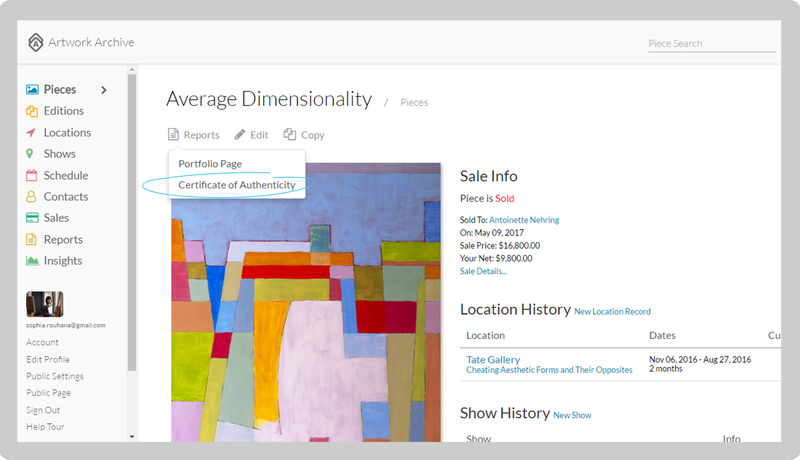 Ready to make your Certificate of Authenticity and more reports with the click of a button? Start your free 30-day trial of Artwork Archive. Hurry! There are art opportunities galore coming to an end this February! What Is the Artist’s Role in Society? We asked artists around the globe about their role as an artist in their local community and world at large. Should You Get a Separate Art Studio? You have an at-home workspace, but is it time to move on? Answer these 10 important questions to see if you should get an art studio. Cataloging your art collection can feel a lot like going to the dentist. You know you should do it, but actually taking the necessary steps seems daunting. And the longer you wait, the harder it is.